On reaching Essaouira and finding the calming campsite mentioned in this post, we finally took some time to unwind. Up until that point we’d barely stayed more than two nights at any one place and dearly needed to stop for a while. 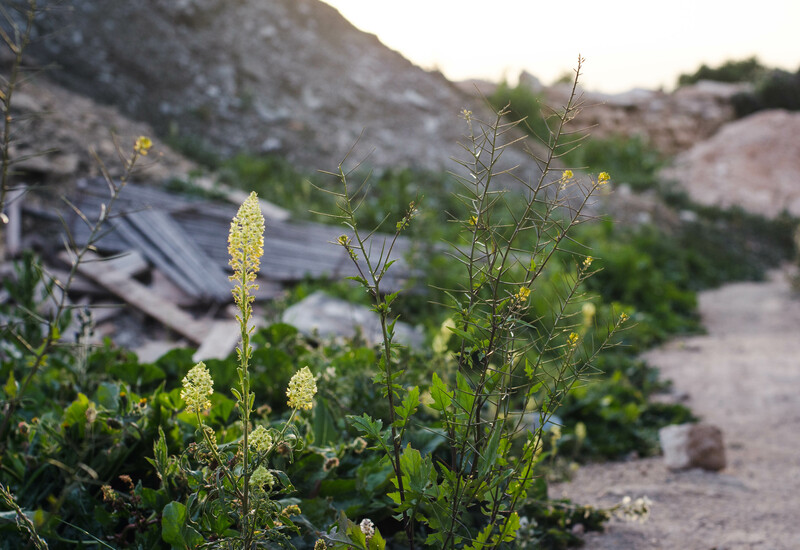 Our time at Esprit Nature restored some of our equilibrium and we hoped that moving on afterwards to a permaculture project down the road would continue the settling down process. 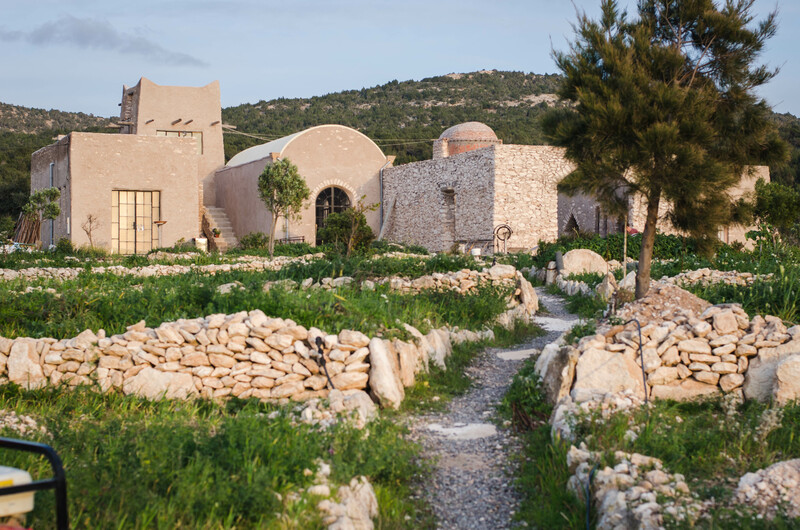 Fertile Roots, as the foundation is known, is homed on a little piece of land close to the sea some 10km up the coast from Essaouira. Although the hills behind are thick with argan and thuya trees, this little strip of earth is wind-stripped and arid. Its owner, Mark Anstice, bought the land without ever clapping eyes on it and although it could be tempting to call the move foolish, having more sympathy for blind leaps of faith these days, I call it bold. I’d been planning to visit Mark since we first conceived of travelling to Morocco but the track to take us to him, almost prevented our getting there at all. Our first attempt saw us give up and go back to the campsite, so un-marked was the track that we weren’t even sure we had the right one. On the next attempt we got stuck. It seemed that in places there was no track at all but in fact just stretches of deep sand where the beach had decided to take residence further inland. It was in one of these sandy pits that Colin came to a halt. We jumped out and scratched our heads. As we had no spades on board I set to work digging us out with the dust pan while Rob searched for stones to put under the wheels. I was beginning to feel a vague sense of foreboding and Rob started muttering about ‘you and your good ideas’ when a couple of bemused locals came along with spades. At this point, as we had no idea if we were even on the right road, I thought it wise to head off and discover if the place existed at all. Dust pan in hand, no water, without telling Rob what I was doing I charged off. Luckily for me, a couple of kilometres along, I found the home of Mark, Ajelen and Gaia, otherwise known as Fertile Roots. Having discovered them, and they me (complete with dust pan, sweat and incomprehensible jibbering about having left my family somewhere stuck in some sand) I returned to Rob and the boys with an American support team (made up of two charming chaps known as Pete and Travis), drove Colin out of the sand and up one of the most unsuitable tracks any motorhomer has ever attempted to drive. That ‘track’, complete with long stretches of beachy nothingness, rocky ledges, tight narrow corners and ridiculous gradients, lingered in my nightmares for days afterwards. I had taken our one and only home in the world to a place from which we may never return. There were many moments when I feared he might tip or tumble right over and the windows still bear the scratches from the relentless scrape of the argan trees we squeezed past. I’m not sure that even now I’m fully recovered from the experience. It’s strange suddenly being part of a community that’s thrown together, there are lots of new folks (Mark, Ajelen, Gaia the baby, Pete, Travis and Mika) to figure out and new ways of doing things. Washing up and going to the loo were more complicated activities than they had been before (water had to be conserved wherever possible and toilet offerings are useful for composting); mealtimes with a group of more than four people presented a few challenges and finding meaningful work for everyone whilst also making sure that the three children were happy and not endangering themselves was work in itself! 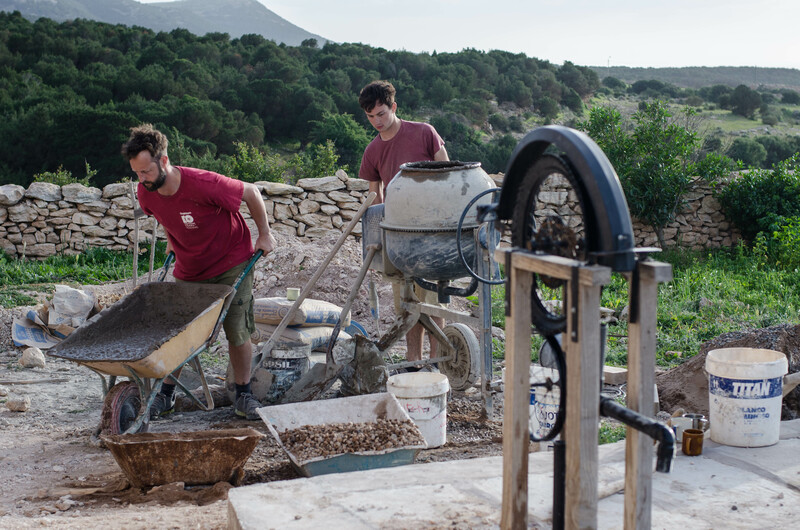 But by the time that we left, Rob had helped build a new water collecting terrace, various mongrel meals had been made and many stories swapped. 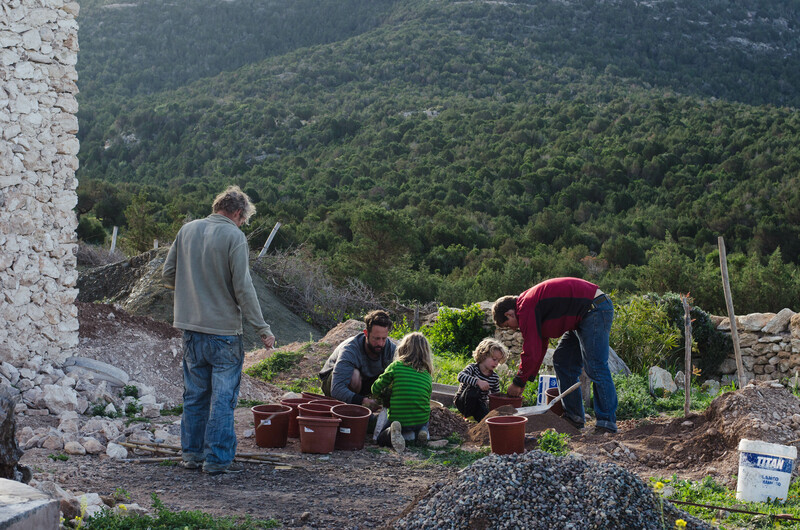 We found ourselves very fond of our workmates and hosts, and increasingly at home with the workings of a permaculture project-in-progress. The boys became largely feral, ranging the grounds and house gleefully unsupervised and one day even escaped to the beach where one had reportedly nearly fallen off a cliff. On other occasions I’d find them up on the roof swinging from beams with a self-made ‘graffling hook’ or climbing halfway towards Mark’s incredible vaulted ceiling on the rope ladder Ajelen hung for them. I managed to help pot up some thuya saplings and even planted five new casuarina trees in five big holes, realising as I did so that nothing in the world makes me happier than putting growing things into the ground. 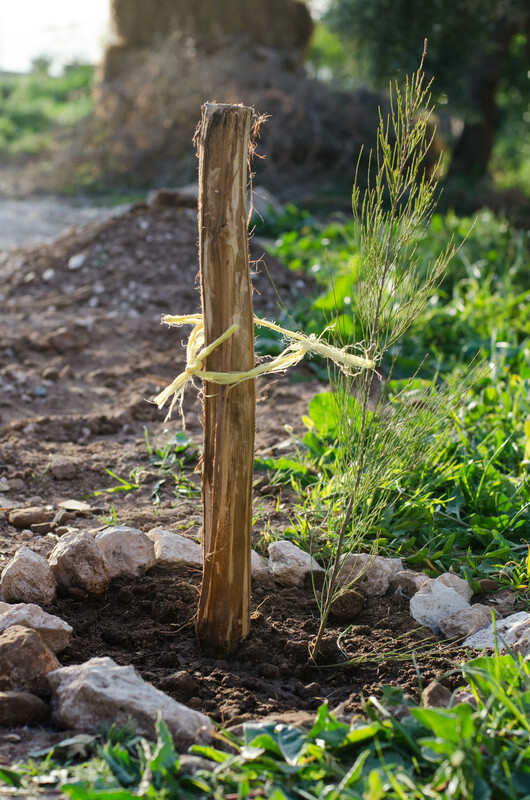 I tried not to feel disheartened about the fact that Mark had a further hundred and ninety five trees to plant. Our time at Fertile Roots taught us a good few things, things that I’m sure will stay with me for life. Maybe the biggest lesson for me was that we are only bound by the limits we set ourselves. Mark and Ajelen told us tales of buying camels and trekking across China; Ajelen had cycled up Mount Fuji and Mark had lived with cannibals and trekked across the Antarctic. Quite apart from what they had managed to create at Fertile Roots, their fearlessness, and sense of the achievable in general, was hugely and wonderfully inspiring. Anything seems possible when in their company. If it hadn’t been for the relentless wind, the build up of sand in the van and the level of grime we all gathered in our short stay, I think we’d have like to stay a little longer. So far, the Fertile Family (as I am henceforth naming them) have built a house, dug a well, constructed a massive cistern with pump, and various other wonders. 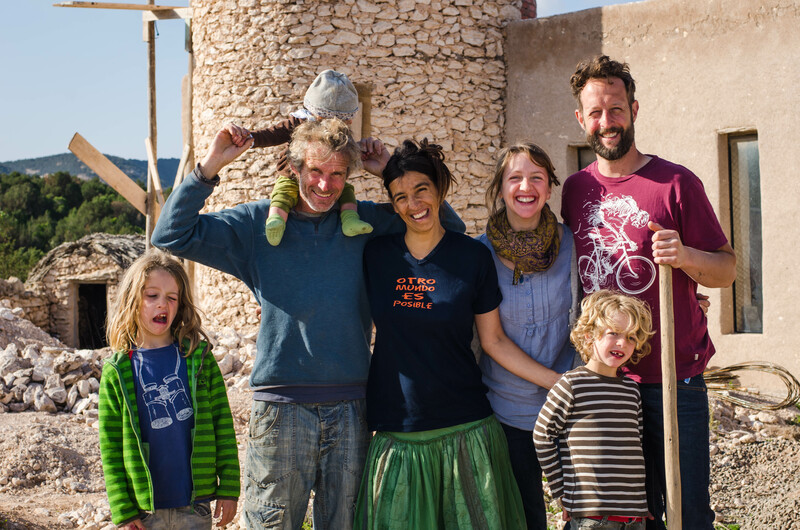 Their plans for the future are to make their home a centre for permaculture learning and the arts. Before we left Mark was talking about building a stage, an irrigation and filtration system complete with plunge pool; using every drop of water at least five times, and eventually maybe achieving his dream of making this little corner of Morocco something akin to the hanging gardens of Babylon. Having met him and Ajelen, I have no doubt that all of this will come to pass and more. *If you’d like to know more about Mark and Ajelen’s project you can find their website here and their Facebook page here. I take photographs and write a bit and have been harbouring romantic notions of a life on the land for as long as I can remember. My partner and I, with our two non-schooled boys, are planning a year long trip in a Hymer motorhome to Morocco and around Europe. © Selina Gough 2015. All rights reserved.